If you happened to read the article about the rewatering of the canal and the flap about the $500,000 grant, or saw the editorial from the Citizen endorsing positive action in regards to the rewatering project; you might be curious and wish for more information. I wanted to give some back ground and share my thoughts. This is not an easy project. It involves agreement between four governmental entities, what the public wants and desires, maintenance issues, engineering, some past history, and unfortunately as we experienced last January, flooding and loss of homes. So let’s get started. The Erie Canal was a man-made creation. There was no stream bed into which the engineers made a canal. The reason that we even have the canal here were the east to west melt water channels that were a result of the retreating glaciers 10,000 years ago. This glacial outflow flow left natural valleys through which the canal engineers could lay out their canal. The reason we have Port Byron was that early settlers began to build homes and businesses around the flowing waters of the Owasco Outlet. So when the Erie Canal was built, the intersection of flowing water and man-made water created the perfect place to grow a village. There are two key factors you need to be aware of to understand any of the current issues. 1) As the engineers laid out the canal through what was dry land, they would on occasion run into a natural flowing stream. In our case, the two streams were North Brook and Cold Spring Brook. The engineers had two choices, they had to find a way to go through the stream, or go around it. And 2) Although we tend to think of the Erie Canal as a eastward flowing stream, because of the landscape in this area, the canal in between Jordan and Montezuma was built with a westward flow. What this means is that Port Byron is downhill from Weedsport. About three-quarters of a mile east of Port Byron, the canal intersects with what is called Cold Spring Brook. Before 1820, this stream flowed out of the hills around Auburn and joined with North Brook somewhere northwest of Weedsport. When the canal was constructed, this small stream was taken into the canal by way of a stream receiver, a structure that slows the flow of water by way of a pool and dam, and allows this water to flow into the canal. In this way, the stream becomes part of the canal and helps to replenish the water. In times of excess water flowing into the canal, the water would over flow the nearby aqueducts at Port Byron and Centerport, a sort of safety valve to help maintain canal levels and protect the canal banks. This 1896 map of the canal shows where was then called Herring Brook (today it is Cold Spring Brook) joins with the canal east of Port Byron. The stream bed to the north of the canal is gone. At Centerport we find the other method that canal engineers used to deal with streams. North Brook is another stream that flows out of the hills from near Auburn, but it is a much larger stream. It would have been unwise to treat this stream as they did with the smaller Cold Spring Brook. And yet the canal needed water from Cold Spring. So a connector between the canal and the stream was dug and control gates were constructed that would allow the canal operators the opportunity to turn the water into the canal as needed, and to turn away the water when not needed. This ditch was called the Centerport Feeder and we can see this connector ditch running alongside the east side of Centerport Road. A mile to the east, the Centerport Aqueduct was built to allow North Brook to flow under the canal and continue its way to the Seneca River. Today, no water is taken into the old canal by way of the Centerport Feeder, but water continues to flow into the old canal through the Cold Spring Receiver. Here you can see how North Brook runs parallel to the canal and then turns to pass under the canal at the Centerport Aqueduct. The blue triangle is the pond that has recently been cleaned and landscaped. 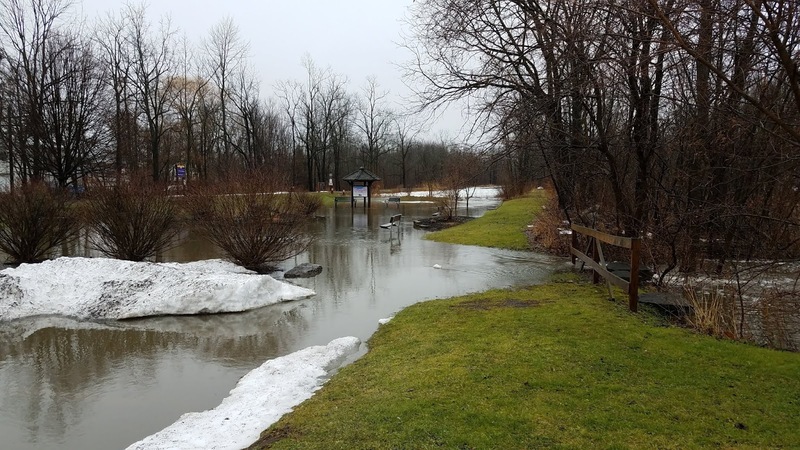 If you were to take a walk along the canal, starting at Schasel Park and walking to Centerport Road, you might notice at first that the canal is raised up on a embankment that cuts across some very wet lands. As you continue to walk east, you will notice that the canal towpath is cut into the surrounding lands. This “cut and fill” method of construction is used today when roads are built. A hill might be leveled and the spoils used to fill in low spots as to make the road as flat as possible. Canals builders used this same technique. And similar to a roadway, the construction of the embankment creates a dam through which the natural flow of surface water (rain fall, snow melt) cannot pass. So ditches are dug along the road to collect this water and funnel it safely away to a nearby river or lake. Canals had the same drainage system and these were called “Blue Line ditches”. You can see this quite clearly right at Schasel Park, where the flow of surface water runs between the towpath and the house, and into a stone culvert that passes under the canal to the south side. When the canal was in use, this water was then taken into a “state ditch” that ran through and under the village and along the old school ball fields on Green Street. This ditch then runs north along Shotwell and empties into the Outlet. Many recall chasing errant balls into the open ditch, or looking for frogs, and perhaps trapping muskrats. You can see the blue line ditches as they cross under the canal, run through the village and then north. Interestingly, these are given the name Cold Spring Brook. When the canal was abandoned in 1918, is was easy to shut off the flow of water through the Centerport Feeder. The dam was closed and the old channel filled in so no water could flow into the canal. But it was different at Cold Spring since the natural stream bed had been filled in over time, and the only route for the stream was to flow into the canal and either go west to Port Byron, or east to the old aqueduct. If the canal had remained intact through Port Byron, it would have been easy to allow this flow to drain into the Owsaco Outlet. But the canal was filled in, so someone had to get the water to flow uphill toward Centerport and North Brook. If you are to walk along the canal, you can see where a dam was built across the canal just to the west of the Cold Spring receiver. I have heard it called the cow crossing, or the gas line crossing, but I suspect it was to stop water from flowing west toward Port Byron. Aerial images from 1938 show this dike in place. 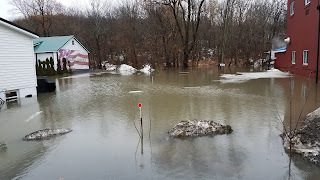 This may have solved the problem of what to do with Cold Spring, but what about the water that continued to collect in the old canal bed between the dam and Port Byron? A pipe was placed into the canal bank near Schasel Park that allows any excess water in the canal to flow into the old state ditch drainage. When it all works, the water in the canal remains about at 4 feet deep. In the 1990’s, the Village, or maybe the school, had the old state ditch modified by installing a large pipe in the ditch and covering it over. I have not followed this ditch all the way to the Outlet, but the section between the back of the firehouse and at least to Shotwell now runs through a pipe. Pipes are not as good at handling large amounts of water as open ditches. As the flow of water increases, the friction of the flowing water increases and thus slows the flow. It is something called the Manning’s Roughness Coefficients. (yes, this coefficient applies to open ditches) And when pipes are allowed to fill with sediments and other debris, the flow is further restricted. When the ditch was open, any flood waters would jump the banks and spread out. With a pipe and constructed channel, the water can only back up until it finds the nearest low area into which to flow. You might recall that the Town filled in the low spot that was the old coal and lumber yard about 10 years ago. I suspect that this low area likely acted as a flood basin, collecting flood waters and allowing them to slowly drain away. When it was filled in, any flood waters had nowhere to collect. Near the library, you will see a large stand pipe where the drains form a 90 degree bend. This turn further slows the flow of water, but can help in allowing the pipes to burp off any trapped air. Another vent can be seen in a back yard along the ball field. To the east of the dam and Cold Spring, nature has been filling in the canal with trees, both standing and fallen, cattails, beaver dams, sediments. Man has helped with a small culvert under Centerport Road. As this natural growth continues to fill the canal, it blocks the rapid movement of water along the channel to North Brook. I suspect that this might cause the water to back up and flow toward Port Byron, where the already stressed drainage system cannot take it. A few years ago, I took these photos near the junction of Cold Spring and the Canal. The engineering study proposed under the grant should be taking all this into account, and hopefully suggesting solutions. I expect that one solution would be to clean out the old canal between Cold Spring and the Centerport Aqueduct. This would allow the Towns to rewater and maintain the canal in the warmer months and drain it when conditions dictate. The filled canal would become a historic and economic benefit in terms of tourism and help with our overall quality of life. In the winter, the drained canal would act like a large basin able to accept large and dangerous flows. But what about the canal at Schasel Park? For the past decades it has had about four of water standing in it. There is no reason to make this any deeper. Four feet will maintain a healthy aquatic life and provide for paddling sports and other uses. And if the drainage through the village was cleaned out and maintained, the system could likely handle any flows that came west. To ensure this, a possible solution would be to install a pipe between the stand pipe by the library and the Outlet directly to the west along the old canal bed. This would shorten the distance that the water would be flowing through a pipe and lessen the restrictions. As you can see, this is a very complicated issue. It not only involves what to do with a world wide known historical artifact, it involves nature, geology, and engineering. I am not an engineer. Nor (I think) is anyone on the Village or Town boards. Some years ago, the Village and Town paid for a study of the rewatering which was deeply flawed. It showed that the rewatering of the canal would flood most of Port Byron and large amounts of land between the village and Centerport. It was easily disproved of since when the canal was in operation, this land never flooded. I understand that some might feel burned by this old study. I hope that a $500,000 grant, with clear goals, will allow all parties the opportunity to study the economic and social benefits of rewatering the canal, and how to mitigate the flooding issue. Flooding at Schasel Park and behind the firehouse in January 2018. The other option is to do nothing. The canal remains a stagnate pool of water and which may or may not flood again. As much as we close our eyes and pretend it is not there, the threat remains. We can not expect the flooding issue to go away on its own. If someone was to say to you, give me $45,000 and I will give you $500,000, you would likely take the deal. It’s good money. I understand the desire to keep not raise taxes, but in terms of the damages that have occurred and are likely to occur again, doing nothing seems odd. If someone has an alternate plan, they should be speaking up. Not planning is simply no plan.